A massive fish die-off at Atascadero Lake is suspected of being due to an algae bloom. During the past few weeks, Atascadero public works crews have removed more than 2,000 pounds of fish carcasses from the lakeshore. 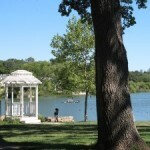 The lake, which is surrounded by a walking trail, is a popular recreation spot. Because of low rain and a buildup of organic material at the bottom of the lake, there has been a decline in water quality and an elevation in water temperature, according to a city staff report. Algae blooms, which thrive in warmer waters, decrease the water’s oxygen level leading to the death of fish and plants. During the summer, the city implemented several emergency measures to combat smelly water quality issues at the lake including the instillation of three aeration fountains, pumps along the shoreline to aerate water, and the daily removal of dead fish from the shoreline. On Tuesday, the city council will consider allocating up to $70,000 to remove sediment from the lake. According to a staff report, the California Department of Fish and Wildlife has agreed to expedite a permit to dredge the lake, which would need to occur before the winter rainy season arrives. I drove around the lake the day they began removing the dead fish. HUNDREDS of fish, not the “50 dead fish” as reported by the Atascadero News. I witnessed 8 crews in the water, using rakes, to drag the carcasses to be tossed into wheelbarrow like units. It was more than disgusting! The lake needs to be deepened; not just higher rainfall alone. It needs to have the attention necessary to get it back to what it was in the 70’s. Limnology is the study of lakes. Lakes have a life span Usually the start of a lake is a clear, deep body of water. Sediments fill the lake and it becomes shallow and turbid. The next step is a swamp that is usually very smelly. Them comes a meadow. So ends the lake. Atascadero is going through its life. If an abundance of algae grows, the water will be shaded and weeds, which need sunlight, will be unable to grow. If the problem is excessive weed growth, the weeds will take up most of the plant nutrients in the water so the algae will be unable to grow. This is why algae removal using algaecides often results in excessive weed growth and, likewise, weed control using herbicides often results in heavy algal blooms. Lakes naturally shift every few years from having an abundance of weeds first, then an abundance of algae, or vice versa. Now, they are selling some treatment system but their info seems to jive with other info I’m finding. Has A-Town seen a bounce between too much algae some seasons, then too much weeds the next? Dredging seems pretty severe (read expensive) for such a small lake. I also learned that certain Carp which can eat algae often eat plants first, so that may not be the way to go, either. Have they considered raising Tilapia in the lake? I hear they are algae-eating machines. I remember the last time the lake was this low in the early nineties. They talked and talked and talked it to death then about dredging the lake with equipment while it was low. Well they talked to much, the rains returned and nothing happened. If we have a regular rainy season, we could get rain sometime within the next forty five days. The clock is ticking. Are you going to pull the trigger this time A-town or let another good and inexpensive (vs bringing in a floating dredge rig) opportunity pass you by again?? ?